Philosophical Film Festival / Филозофски Филмски Фестивал is a unique film festival that lives on the crossroads between philosophy and film and is held annually in R. Macedonia. On one side, the festival tries to promote the idea of film as a medium which can provoke philosophical thought and illustrate philosophical ideas. On the other, it aims to trigger aesthetical analysis’ and investigations into film language as a form sui generis and empower young filmmakers and film workers to reflect on key concepts, questions and ideas in order to translate them into the visual language of cinema. It is a pioneering festival of the kind in Macedonia and the region, and one of few in the world connecting film and philosophy. “Golden Owl” Jury Award & Audience Award for Best Feature Film and Best Short Film. Philosophical Film Festival (original title: Филозофски Филмски Фестивал) is organised by the non-profit organization Philosophical Society of Macedonia registered in Republic of Macedonia. 09 – 16 May 2019 in Skopje, R. Macedonia. – is with English subtitles. 2. The submission is free of charge. 3. Only the entrants whose films were selected will be notified, as we are not able to inform individual applicants about the rejection nor its reason. 1. Feature films and short films will be considered for the official competition. 2. Successful submissions will be announced on 5th March 2019. 3. The Jury appointed by the Festival’s organizers will award the ‘Golden Owl’ Jury Award for Best Feature Film and Best Short Film on PFF 2019. Submitted films are assessed in terms of artistic quality and philosophical relevance and the jury’s decision is absolute and final. The Audience of the Festival will award the ‘Golden Owl’ Audience Awards. 4. The awarded films will be shown one more time on two film academies in the country with which the Festival is collaborating (Film Academy, University “Goce Delchev” – Stip and FIOFA Film Institute – Ohrid Film Academy) and/or for a Best Feature Film (Jury/Audience award) repetition after the end of the festival. 1. 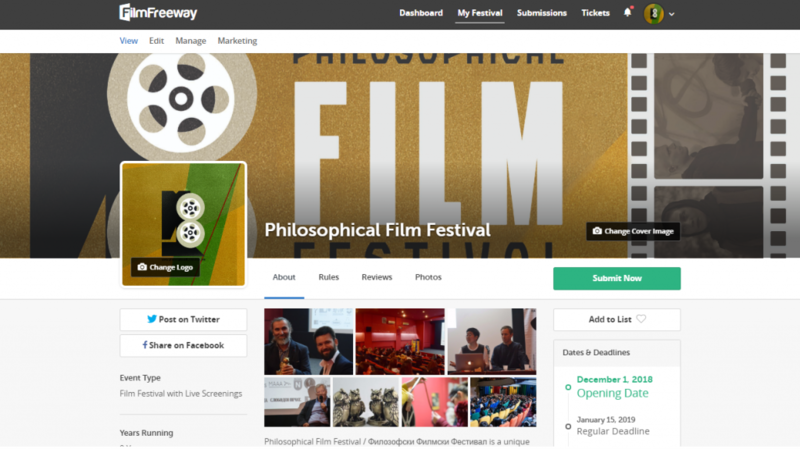 Films may be submitted electronically via FilmFreeway only. 3. The submission deadline is 15th January 2019. 5. The person submitting the film gives their permission to screen the film during the Festival and during other events promoting the Festival arranged by the organizer with no screening fees. 6. The Festival reserves the right to invite a film which was not submitted to the Festival. 1. The film copies (selected films) should be sent electronically via online link. 2. The films should have English subtitles and will be screened with, both, Macedonian and English subtitles. Submitting a film to the Philosophical Film Festival is equivalent to the acceptance of the conditions set out in the above Rules & Terms. Within the Official Selection of Feature Films the Philosophical Film Festival will showcase six (6) feature films produced in 2017/18 and examine them through a philosophical perspective. The selector of the festival is going to be looking for films having, both, artistic qualities and philosophical relevance. Short fiction films inspired by a philosophical idea or inspiring philosophical reflection. On two evenings PFF will show the audience around 20 short films in competition. The films should be no longer then 20 min. (student films are also accepted).